Laurie was diagnosed with triple-negative IDC (a less common type of breast cancer) in July 2018 and started treatment in late August. Triple-negative cancer is hard to treat; it has a high recurrence rate and the first round of treatment is the most critical to survival. Laurie is currently in the middle of a 16-week course of chemotherapy, which will be followed by surgery and probably radiation therapy. Active treatment is expected to go through April, or possibly longer depending on how well it works, and full recovery from surgery may take longer than that. In the meantime, Laurie is unable to work during treatment and, as a longtime freelance writer & editor, is not eligible for any EDD/state or local disability benefits. 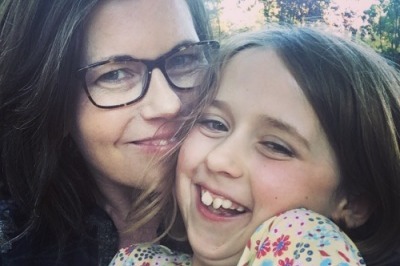 Her emergency savings is dwindling fast, so we, The Love Team, are raising funds to help her and her 7-year-old daughter, so Laurie can fully focus on healing. Funds will be used to cover basic living expenses (rent, utilities, car payments, groceries, gas) and any medical or supportive care costs that are not covered by health insurance. Anything helps! Even if you can't donate, please share widely; we know Laurie is connected to many communities and people that we may not be directly in touch with. And if you donate by 11/5, there's a bonus: you'll be automatically entered in the Benefit Raffle being held in Santa Rosa on 11/8 -- there are some fantastic prizes donated by generous friends, and you don't have to be there to win. Just indicate # of tickets you'd like at $5/each. You can find more details about the 11/8 benefit show & raffle on Facebook. Want to donate some art, or a good or service to the raffle? Please contact Melati Citrawireja via the Facebook link, or email Melaticitrawireja@gmail.com. Laurie had surgery in early January to remove the remains of what was once a horrifyingly large tumor, magically shrunk by months of chemo down to just 0.4 cm of active cancer, surrounded by about an inch of dead cancer cells. Her recovery from surgery was slow but steady, thankfully without any serious complications, and she started radiation last week. We're in the home stretch! Cancer treatment and recovery is a long, difficult road. Many of you know, either from personal experience or through someone who is close to you, that a life-threatening illness and months of treatment mean a prolonged financial recovery, too. We are so grateful for the support Laurie has received from friends, family, friends of friends, and complete strangers. You’ve just blown us away. We’re really close to reaching our goal now and if Laurie can come out the other side of this with some financial buffer, she and her little daughter we be better positioned to restart their lives and figure out the "new normal." Here’s some good news—an anonymous donor has promised to close out this fundraiser with $500 if we can get to $14,500 before Laurie finishes radiation on March 19th. We know everyone is fighting a battle, some small, others epic, and we are deeply, sincerely grateful for every dollar this campaign has raised. Peace of mind is so often out of reach. Your donations have given Laurie so much heart to help her through this difficult time without the extreme financial stress faced by so many cancer patients. Laurie hopes to start working again in April, but for now she is still in active treatment and still fighting. We thank you for being part of the team that is getting her across the finish line. Be well! For those not in direct contact with our family, we wanted to let you know that Laurie finished chemo in December and the results were good -- really good! Chemo was rough, but the cancer has shrunk significantly and does not appear to have spread; the medical team (and Laurie!) are optimistic. Laurie is scheduled for surgery this coming week, which will be followed by radiation in early February. If all goes well, she will complete active cancer treatment in early March. Our gratitude goes out to all of you for your kind and generous support, in all the forms it has taken -- it has helped so much during a very difficult time, and continues to ease what will, hopefully, be the home stretch. Wishing all of you wonderful humans a happy & healthy 2019!! !